Zaffiro is pleased to be included in this comprehensive look at the ring- everything from high concept pieces to our interpretation of a very ancient form of the craft. Amazon’s ‘Look Inside’ covers approximately the first quarter of the book. We’re included much later on (page 332, to be exact), but you can certainly get a feel for the wide range of works presented. To be included in this book, we first submitted a small collection of images, along with thousands of other artists. 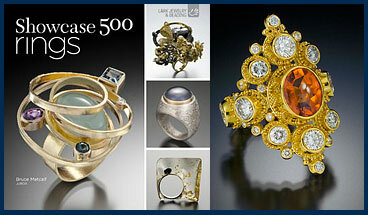 Bruce Metcalf, a venerable and widely exhibited studio metalsmith, juried the images to select the 500 best representations on the theme of the ring. Take a look, and don’t miss getting a first edition of this important and exciting release. Of course, we’d encourage you to preview at Amazon, but buy from Powell’s Books – our amazing local bookstore and one of the highlights of any visit to P-Town.